Witness the beauty of underwater fluorescence on your next night dive with the VL4000P Fluorodiving Kit from Bigblue. 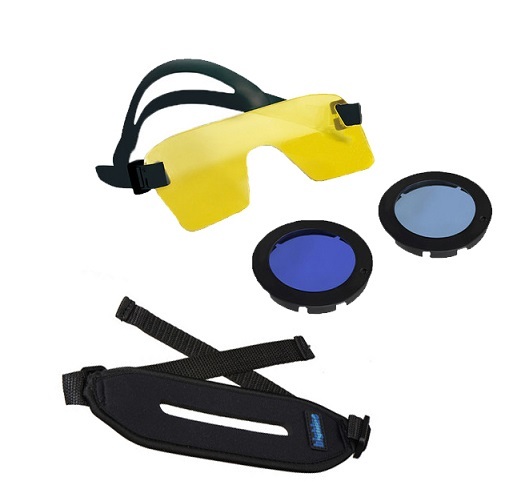 It is designed for use with the VL4000P Dive Light, and consists of a blue filter, a deep blue filter, and a yellow blue-barrier filter mask. This kit is designed for observation of certain corals, fish, and other underwater organisms, which have fluorophores in their proteins. 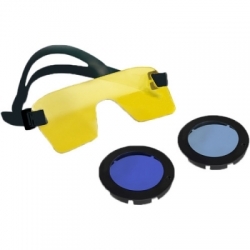 These fluorophores are invisible to the naked eye, but can be seen with the filters supplied in this package. By placing the blue and deep blue models over your dive light, you alter the color of the beam to match the wavelengths that excite the organisms and cause them to emit the fluorescent glow. The yellow blue-barrier filter with a neoprene strap fits over most standard dive, scuba, and snorkeling masks. It blocks the excitation light and increases the intensity of the colors emitted, allowing you to see this visually stunning fluorescence. The snap-on and flip-open filters allow you to switch easily between blue and white light to accommodate changes in dive conditions. This kit is suitable for night divers, specialty photographers, resorts, science institutions, and ecological monitoring groups. Included in this kit - 2 unique filters + mask & strap.